Kevin Phillips (born December 11, 1981) is an American film actor, best known for his leading role in Suna Gonera"?s Pride (2007), as well as his role in 2009's Notorious. 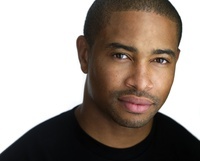 Kevin starred in the George Lucas-produced 2012 film Red Tails, which chronicles the story of the Tuskegee Airmen. This webpage uses material from the Wikipedia article "Kevin_Phillips_%28actor%29" and is licensed under the GNU Free Documentation License. Reality TV World is not responsible for any errors or omissions the Wikipedia article may contain.